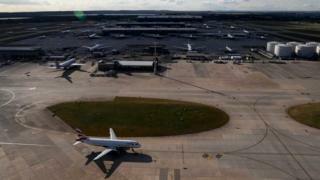 Britain must expand Heathrow, a "great airport" which connects the UK to global trade, George Osborne has said. The economic case is "overwhelming" and the airport connects to the Northern Powerhouse, the former chancellor said. Gatwick expansion could be considered, but it must not be at the expense of the west London airport, he tweeted. A decision on which London airport should build a new runway is thought to be imminent, after years of argument and a delay because of the Brexit vote. Three plans have been in contention - a third runway at Heathrow; a new runway at Gatwick; and an extension to one of Heathrow's existing runways - as part a review of extra capacity by 2030. 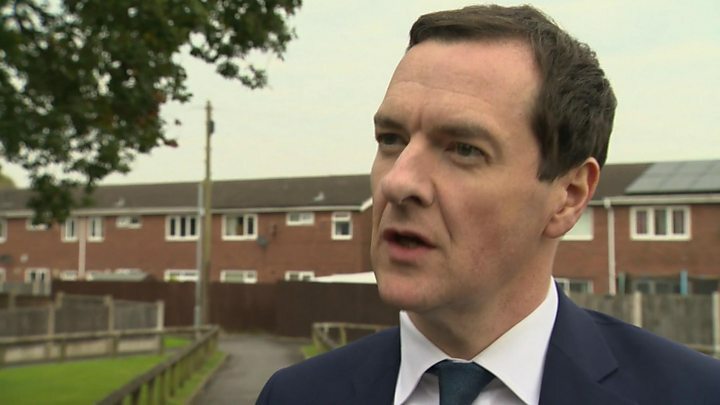 Mr Osborne, who is MP for Tatton in Cheshire, said he was clear which one had most merit. "Time for a decision on airports & go for Heathrow. Economic case overwhelming; connects Northern Powerhouse; ensures Britain is open to world," he tweeted. "If we want Britain to be outward-looking, free-trading & global, we must expand the great airport that connects us to that world & that trade. "We can consider Gatwick expansion. But not at the expense of Heathrow - and not in parallel or else, in practice, nothing will get built." He later told the BBC that the case for a new runway at Heathrow was overwhelming "in terms of jobs and growth for Britain". "There are very strong economic reasons for expanding Heathrow," he said. "It connects up the rest of the country including the north and the Midlands, and it also opens Britain up to the world." Mr Osborne rejected suggestions he had vacillated over the issue while in the Treasury, saying he had commissioned the Davies commission to examine all the options. He said the work of the commission - which concluded in 2015 that all three options were credible but a new runway at Heathrow was the strongest proposal - meant the public would have "all the facts". The former chancellor was replaced with Philip Hammond in July by incoming Prime Minister Theresa May in the wake of the UK's vote to leave the EU. Transport Secretary Chris Grayling has said a decision over where to site a new runway in the south east of England will be taken "shortly". Heathrow looked close to being expanded in July 2015 after an official commission recommended it. But the decision was delayed in December for further environmental studies. It was again put back in June after the EU referendum vote. A decision is expected this month. Foreign Secretary Boris Johnson and Education Secretary Justine Greening are among a number of prominent opponents of Heathrow expansion in the cabinet. The Scottish government confirmed earlier this week that it was backing a new runway at Heathrow, saying it offered significant strategic and economic benefits for Scotland. But the owner of Stansted airport has said it would consider legal action if, as well as giving the green light to Heathrow, ministers told Gatwick it could expand but over a longer timeframe. The Manchester Airports Group told the Guardian the question of additional capacity after 2030 needed to be considered separately, with other airports allowed to stake their claims.